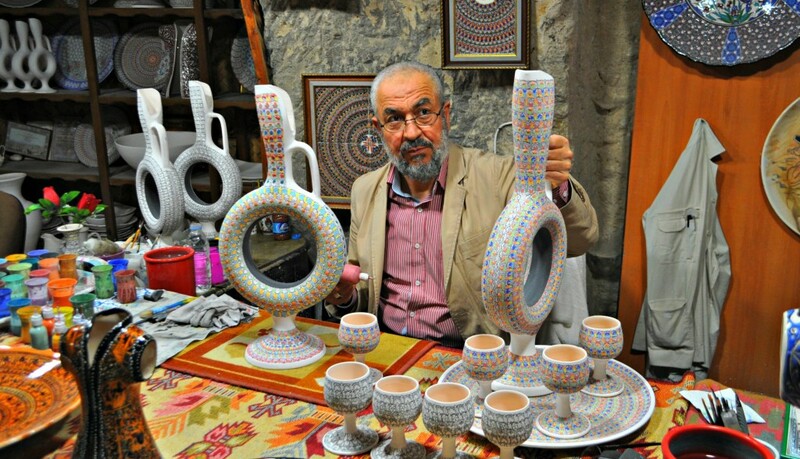 « Day 518 In Beijing: Blue Tour In Cappadocia, Sultan’s Ceramics. Day 519 In Beijing: Blue Tour In Cappadocia, Sultan’s Ceramics Wine Vase. An artist and his work. These are vases for pouring water or wine. Jill and I were checking out the beautiful art at Sultan’s Ceramics when our guide decided to show us exactly how the vases were used. It is really hard to explain, or show, on a blog what it is like being in such a different world, but I do my best. Consider that we met 8 days before I moved to China, and Jill came here about 1.5 months after that (without any plans to come to China before meeting me), it is pretty amazing to think that we’ve now been to Beijing, Shanghai, Xi’an, Tianjin and a few other cities in China. Add to that Malaysia, Sinagpore, Mongolia, Turkey, and Greece, it has been an amazing way to learn about each other and grow as a couple. They say that going on a trip lets you realize if you are compatible and, if that is true, we are probably the most compatible couple in the history of the universe. We rarely have disagreements, and I think we’ve only really argued once, and that with the pressure of living in China, her working on her website SF Tourism Tips, while dealing with the Great Firewall of China, and my job as a psychotherapist, is an excellent barometer of our ability to handle pretty much anything that comes our way. We plan to keep traveling for most of our lives, unless we find just the right magical spot to settle down and this puts us at an advantage because we already know that we can travel well together and balance each other when times get tough. I’m not saying everything will be roses, all the time, just that there is something wonderful about having a partner, and being a partner, that the other person can depend upon to be there when either of you is needed. Being on these tours, and travels, with Jill, reminds me of the joy and love that can be present in this world when someone takes the time to focus on what is important and keep working until your dreams come true. Watching the men work on these pieces of art, I think they are doing the same thing each moment they throw the clay, form it, and paint it.